Warner Bros. Limited Edition Animation Art:"Marc Antony and Pussyfoot Model Sheet" - Warner Bros.
Home | Disney and Animation Art | Warner Brothers & DC Animation Art | Warner Bros. | Warner Bros. Limited Edition Animation Art:"Marc Antony and Pussyfoot Model Sheet" OFFICIAL | Gallery Direct Art | 800-733-1144 Free Ship. No Tax. 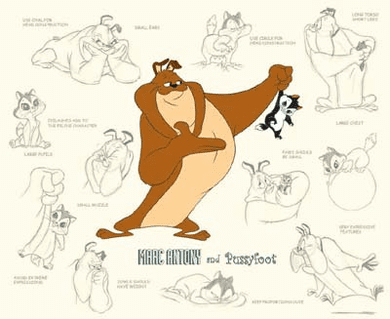 Warner Bros. Limited Edition Animation Art:"Marc Antony and Pussyfoot Model Sheet"
About the Art: Marc Antony and Pussyfoot remain one of the most adored pairings in Warner Bros. classic animation history. First introduced by Chuck Jones on February 2, 1952 in "Feed the Kitty." The duo of brute strength and cute innocence usually entailed Pussyfoot climbing aboard the back of Marc Antony to scratch and tug at him until she made herself feel warm and safe and therein fell asleep. Despite the trouble Pussyfoot gets into, the strangely devoted Marc Antony is always present to take the blame. Both Marc Antony and Pussyfoot were successful secondary characters before their staring roles. Previously they appeared with Claude Cat and Hubie and Bertie, but were never named. While Marc Antony's name has always been consistent, Pussyfoot has also been known as Kitty and at times Cleo. Noted animation director Darrell Van Citters rendered the original drawing for this edition. The background was adapted from original model sheets and reproduced utilizing the fine art Giclee process. A model sheet shows each character from various angles and with different expressions. Since a number of animators work on a single cartoon, the model sheet ensures that a consistent look is maintained throughout the production. The Marc Antony and Pussyfoot is sold in an edition of 100.